The 2008 exhibit was a display of the pottery of Edgerton. This small city had a disproportionate number of major pottery companies through the years. 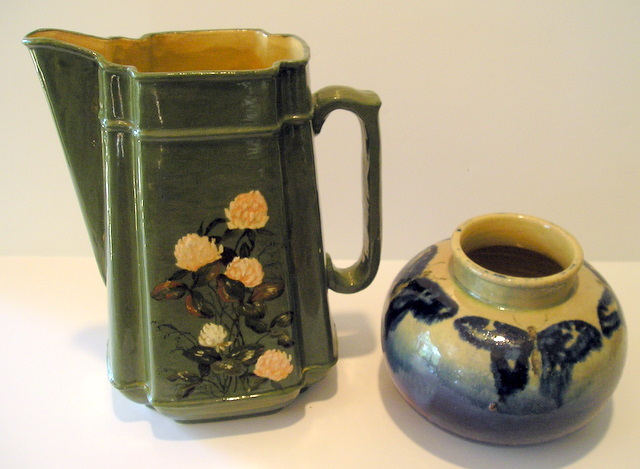 Pauline Pottery was founded by Pauline Jacobus originally in Chicago, but was moved to Edgerton. 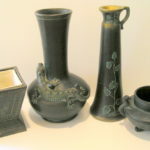 Eventually there was American Art Clay Works, Edgerton Pottery Company, Rock Pottery, Pickard China, Edgerton Art Clay Works and Norse Pottery. 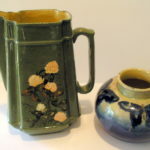 The following information and gallery was shared via the Wisconsin Pottery Association’s 2008 Exhibit at the Alliant Energy Center in Madison, Wisconsin. 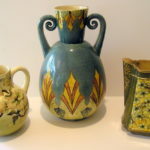 For the small village of Edgerton Wisconsin, the years of 1888 to 1913 were significant in their contribution to art pottery in the United States, but even more so for Wisconsin. 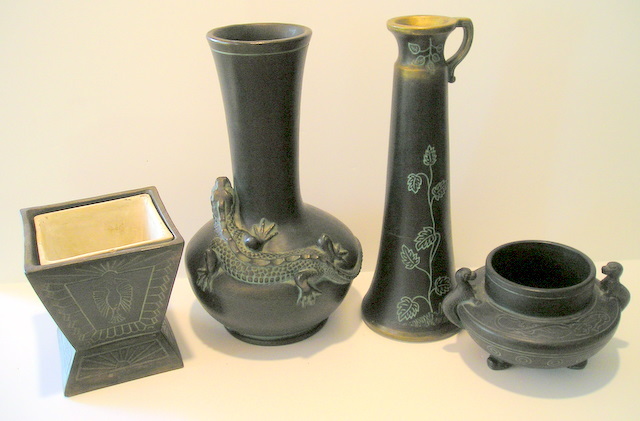 During this short period, seven firms with ties to the town produced a wide range of pottery. To be expected, many of the same people were involved in different firms at different times. 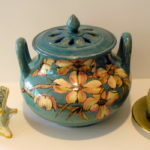 The exhibit focused on the art pottery that was produced by Edgerton related firms in this short time frame, excluding the large quantity of porcelain & dinnerware production. Pauline molds were used but she was probably not connected with it. Note the decorations are very different from Pauline in both glaze and surface decoration. 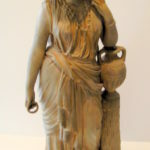 Founded by brothers Thorwald and Hans Samson and Louis Ipson, they created terra cotta figures and statues from local clay. The firm was taken over by investor / lawyer Louis Harvey Towne who changed the name to the Edgerton Art Clay Works. Town hired jean Pond Mineu who is famous for her statue “Forward” created in 1893. In the exhibit is “Consultation”. 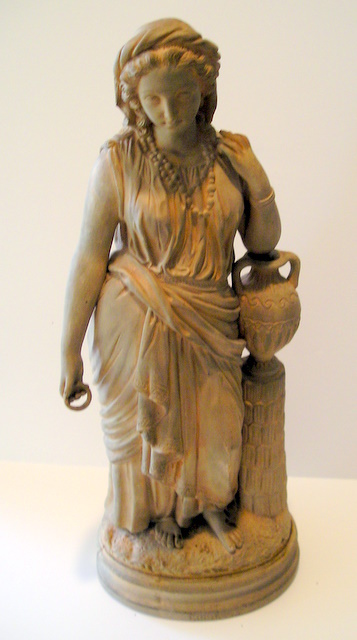 Also Helen F Mears also worked for the firm creating statuary. 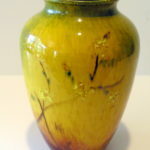 Originally started in a rented Chicago house by Pauline Jacobus and her husband Oscar, Pauline produced the first art pottery created entirely in Chicago. 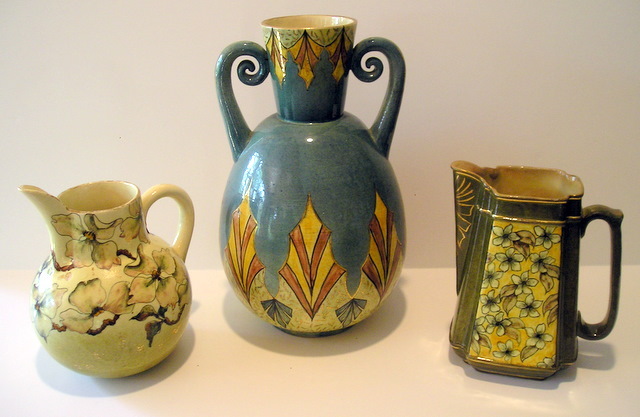 Pauline Pottery was sold in some of the finest stores like Marshal Fields in Chicago and Tiffany’s in New York. The pottery was in such demand that they expanded production in Chicago once before moving the pottery to Edgerton in 1888. The move to Edgerton was due to its supply of suitable clay. Following the death of Oscar Jacobus in May 1893, the Pauline Pottery was foreclosed & reorganized into the Edgerton Pottery Company. 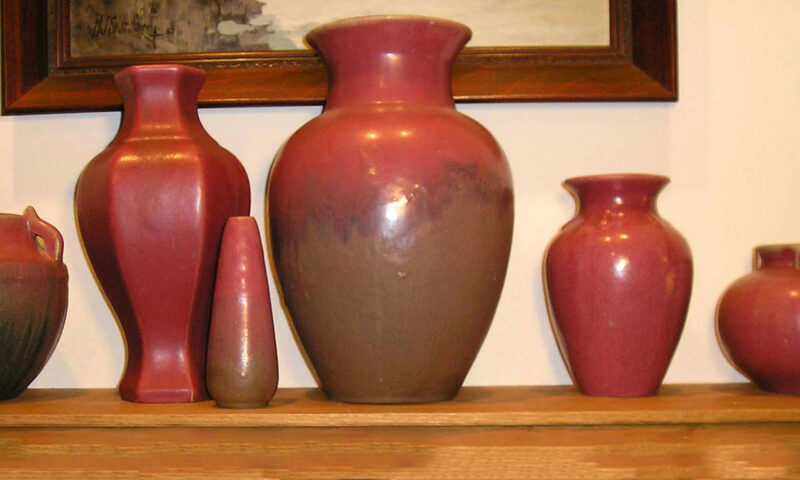 The Pauline Pottery restarted in 1901 when Pauline Jacobus started production at her home. She continued to produce items until 1909. One time employees of Pauline Pottery include Wilder Austin Pickard, Thorwald Phillip August Samson, Hans Christian Anderson Samson, Louis Ipson & Mae Johnson. Started by two molders, Thorwald Samson and Louis Ipson from Denmark who were originally hired by Pauline Pottery. The firm moved to Rockford Illinois in March of 1905. You can see in the exhibit that the candle stick is the same mold as used at Pauline Pottery. It’s hard to notice that they are the same mold due to the dramatic difference in surface decoration. References: Edgerton’s History In Clay, Pauline Pottery to Pickard China (Maurice J. Montgomery) Pauline Pottery – a pictorial supplement to “Edgerton’s History. 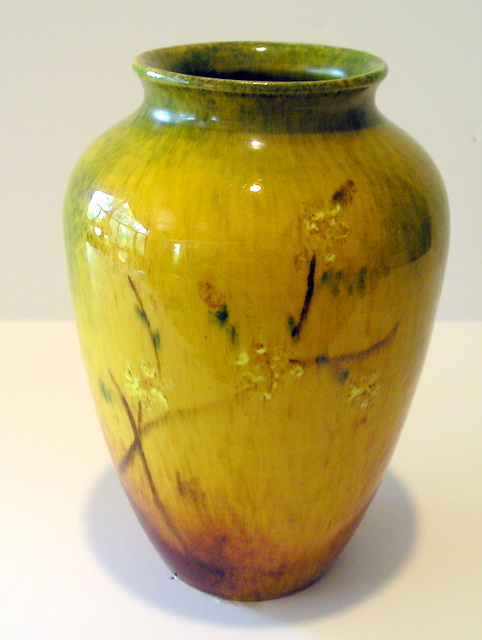 Pickard’s vast amount of work is not on display in today’s exhibit of Art Pottery. 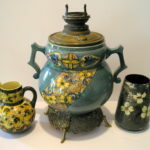 Their start was in Edgerton when Wilder Pickard joined Pauline Pottery as their first salesperson for a territory that covered the upper Midwest from Michigan to Minnesota to Missouri to Indiana. The firm began by producing hand-painted, gold highlighted china with eight to ten decorators. As the firm grew larger & larger, it moved to several locations in the Chicago area where it still operates. 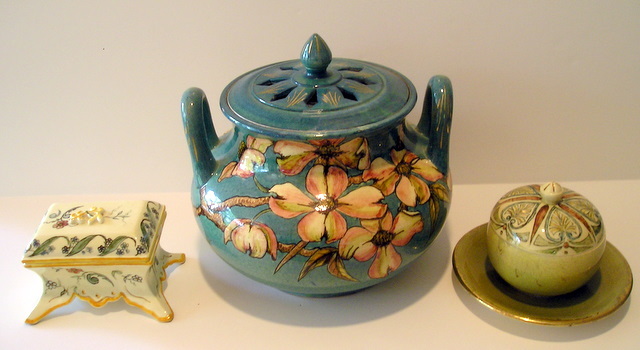 Started by Helen Knutson the name, Edgerton Pottery Company, was misleading because their wares were porcelain. Later the name was changed to Expressions in Porcelain which better reflected the wares that were produced. 1892 – American Art Clay Works opens with Thorvald Samson. 1893 – Oscar Jacobus dies Rock County purchases items for the World’s Fair to be held in Chicago from American Art Clay Works & Pauline Pottery. W. A. Pickard purchases china blanks. 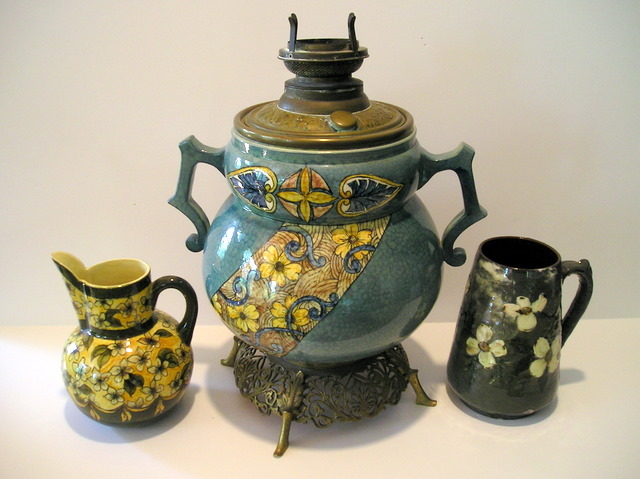 1894 – Pauline Pottery merged into Edgerton Pottery Company. 1901 – Edgerton Pottery Company closes. Below is a small sampling of some of the pottery that was displayed.